AV Danzer has provided new office accommodation for Mabey Hire. Mabey Hire specialises in the hire of non-mechanical plant equipment, and has an extensive series of depots throughout the UK. Danzer supplied a new modular office unit at its Iver depot. 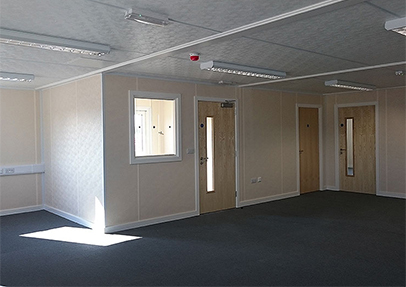 Danzer's Linkpak NG modular product proved to be a great choice as it offers the ability to create open spaces at low costs and the whole building was built by Danzer, here in the UK, delivered and installed for just £135,000. The project features five 12x3m Linkpak modules which together form the new building which provides 180 sq m of space. Linkpak’s flexibility has allowed us to design a low-cost, energy efficient building which provides an office space, meeting room, canteen and kitchen facilities, toilets and a drying room. It is clad externally in plastisol steel with magnolia vinyl faced plasterboard walls and white ceiling. As with all of Danzer's buildings it is insulated to meet current building regulation requirements and Danzer have included white UPVC double-glazed windows and powder coated double glass panel doors. Internal doors are finished in an Ash veneer. Av Danzer are delighted to help another great British firm by providing a low-cost building which will increase energy efficiency, which makes the most of limited available space and delivers minimal environmental impact.